Typical cedar trees in the Katori area in Sawara have plenty of oil and therefore do not easily decay. It is said that Tsukuba fall wind nurtures good cedar. 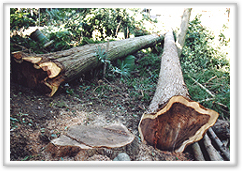 Trees are cut down during winter when the water content becomes low. The life of a wooden boat depends on the quality of wood.